Nonalcoholic fatty liver (NAFL) is an accumulation of excessive fats on liver without alcohol intake . The progress of NAFL is associated with insulin resistance, obesity and hyperlipidemia . Hyperlipidemia is an increment in one or more of the plasma lipids, including triglycerides (T. Gs), cholesterol, cholesterol esters, phospholipids or plasma lipoproteins, including very low-density lipoprotein (VLDL-C) and low-density lipoprotein (LDL-C), and a decrement in high-density lipoprotein levels (HDL-C) . There is a positive correlation between myocardial diseases and elevated LDL-C and VLDL-C levels, and a negative correlation with HDL-C. Where, HDL-C prevents the uptake of LDL-C into the blood and favors the transport of cholesterol to the liver to be catabolized and excreted from the body . High-cholesterol diet is considered to have a fundamental role in the progress of various cardiac pathologies as it results in development of hyperlipidemia that makes the heart unable to adjust any oxidative myocardial stress  and is the main risk factor in the atherosclerosis and cardiovascular diseases causing more than 80% of deaths . There are compounds that can eliminate the excess of fats on the liver, called lipotropic factors such as choline that is chemically similar to the B-vitamins. Choline enters in the structure of cell membrane and mitochondria as well protects against the accumulation of fats on liver . It may also help in lowering cholesterol and homocysteine levels associated with cardiovascular disease, and some types of cancers . Nutraceuticals are natural food products that can protect the cell against different pathologies induced by oxidative stress via promoting the endogenous antioxidant status of the cell . Diets enrich with fruits and vegetables can decrease risk of some diseases such as coronary artery diseases and some types of cancer . Onion (Alliiumcepa L.) and garlic (Allium sativum) belong to the family Liliaceae and are extensively used as medicinal plants. They have numerous polyphenols and organosulfur compounds mainly in the form of cysteine derivatives . Moreover, they have a beneficial effect against obesity, hyperlipidemia, cardiovascular diseases and diabetes . Onion has flavonids especially quercetin which is a strong antioxidant that scavenge ROS in rats with metabolic syndrome . Garlic had been proved to recover the bad lipid profile that resulted from the high cholesterol diet through its polyunsaturated fatty acids . As it is important for hyperlipidemic patients to be aware of the safety and effectiveness of these agents, the current study was done to evaluate the possible impacts of choline, onion oil, garlic oil and combination of both oils in ameliorating the harmful effects of high fat diet in albino rats through the assessments of body and liver weight, serum lipid profile and some biochemical biomarkers of liver and heart functions. In addition to, hepatic and cardiac tissue oxidative stress status along with, histopathological examination of liver and aorta. Choline Chloride-(2-Hydroxyethyl) tri-methyl ammonium chloride-was purchased from LOBA Chemie, India. Onion and garlic oils were procured from local market as commercial products manufactured by El-Captain Company, Cairo, Egypt. Serum lipid profile parameters kits were obtained from ELITech Diagnostic-France. Liver transaminases (ALT and AST) were purchased from Randox Laboratories Ltd., UK. Lactate dehydrogenase (LDH), CK-NAC and CKMB kits were obtained from Diagnosticum Zrt., Budapest, Hungary. Total proteins and albumin were procured from Biodiagnostic Co., Egypt. Serum leptin, adiponectin and H-FABP were measured using ELISA kits (KAMIYA Biomedical Company, USA). TNO kit was secured from Cayman Chemical Company, USA. Kits used for determination of malondialdehyde (MDA), reduced glutathione (GSH) and superoxide dismutase (SOD) were obtained from BioVision, USA. GC-MS analysis was performed according to Packia et al. for onion oil and according to Guo et al. for garlic oil, using Trace GC Ultra-ISQ mass spectrometer (Thermo Scientific, Austin, TX, USA) with a direct capillary column TG-5MS (30 m × 0.25 mm × 0.25 μm film thickness). Forty-two male albino rats, weighing 90 to 120 gm, were obtained from pharmaceutical Pharco Company, Cairo, Egypt. They were kept one week for adaptation. The experiment was carried out at the Animal House, Faculty of Veterinary Medicine, Suez Canal University. They were housed in cages under environmental conditions (20°C and 55-60% relative humidity), 12 h light/dark cycle. This study followed the institutional animal care guidelines and was approved by the Research Ethical Committee, Faculty of Veterinary Medicine, Suez Canal University, Egypt (Approval number 2018058). Rats were divided randomly into six equal groups, each of 7 rats. The experiment lasted for 2 months. During the experimental period, treatment regimen was as follow: Group I (control): rats fed on basal diet  (TABLE S1). Group II (F): fatty untreated rats fed on fatty diet  (TABLE S2). Group III (F-choline): rats fed a fatty diet and supplemented with choline chloride at dose of 3 gm/100 gm diet . Group IV (F-OO): rats fed on fatty diet and supplemented with onion oil at 100 mg/Kg body weight by gavage . Group V (F-GO): rats fed on fatty diet and supplemented with garlic oil in dose of 100 mg/Kg B.W by gavage . Group VI (F-Mix): rats fed on fatty diet and supplemented with both onion and garlic oil sat the same doses of groups IV and V by gavage. Table S1: Basal diet composition for control group as described by Qamar et al., . VLC-HF: Very Low-Carbohydrate, High Fat. * Values, except for energy density, are rounded to units. Table S2: Diet composition for fat fed group as described by Axen and Axen . At the end of the 2nd month of the experiment, rats were weighed then starved overnight for 12 h before the blood collection. Blood samples were obtained from retro-orbital venous plexus of rats after anesthesia with sodium pentobarbital I/M injection at a dose of 50 mg/kg B.W and put in plain centrifuge tubes for clot formation, samples were centrifuged at 3000 rpm for 10 minutes then the clear sera were collected carefully and stored at -20°C until estimation of lipid profile, liver and heart function biomarkers and different biochemical assays. After blood collection, rats were sacrificed; liver, heart and abdominal aorta were excised. Liver was weighed, and then a piece of liver and aorta were fixed in 10% neutral buffered formalin for histopathological examination. Another piece of liver and heart were stored at -80°C for further measurements of SOD activity, GSH and MDA levels. Serum total cholesterol (TC) was determined according to Rivellese et al. , triglycerides (TG) and high density lipoproteins (HDL-C) were determined according to Tietz , low density lipoproteins (LDL-C) and very low density lipoproteins (VLDL-C) were calculated by the formulas described by Davidson and Rosenson , alanine aminotransferase (ALT) and aspartate aminotransferase (AST) , lactate dehydrogenase (LDH) , total protein (TP) , albumin , leptin  and adiponectin hormones according to the manufacturer’s instructions. Serum Ck-NAC was estimated as described by Mathieu  and CKMB , H-FABP  and TNO . Parts of liver and heart tissues were immersed in ice cold normal saline and were homogenized by tissue homogenizer. The homogenate was centrifuged at 7,000 rpm for 20 minutes at 4°C. The supernatant was assembled and used for the antioxidant profile analysis as follow: MDA was assessed as a marker of lipid peroxidation in the hepatic and cardiac tissues as described by Kei . Enzymatic antioxidant activity in tissues was evaluated; SOD according to Nishikimi et al. . While, the non-enzymatic antioxidant level in the tissues; GSH was done as Beutler et al. .
Liver and abdominal aorta specimens were immediately fixed in 10% formalin. After proper fixation, the specimens were dehydrated in ethanol, cleared in xylol, then embedded in paraffin and stained with hematoxylin and eosin stain . All the statistical analyses for the obtained data (Mean ± SE) were carried out using SPSS version 20 for windows (SPSS Inc., Chicago, IL) via one-way ANOVA with Duncan’s post hoc test. The P value was considered to indicate significance among groups at ≤ 0.05. Onion oil: The chemical composition of onion oil DADS, dodecane,2,6,10-trimethyl, trisulfide methyl 2-propenyl, 2-bromo dodecane, 3-vinyl-[4H]-1,2-dithiin, and tetradecane,2,6,10-trimethyl were 0.60%, 0.88%, 0.44%, 0.30%, 0.67%, and 0.57%, respectively. Garlic oil: The chemical composition of garlic oil DADS, 2, 2-dideutero-octadecanal, oleic acid, 1, 54-dibromo tetrapentacontane, dotriacontane, and isochiapin B were 0.60%, 3.03%, 2.58%, 4.80%, 10.99%, and 2.61%, respectively. As shown in TABLE 1, body and absolute liver weight significantly (P ≤ 0.05) increased in F-group compared to control group, while, significantly (P ≤ 0.05) decreased in fat treated groups with different supplements when compared to F-group. There was no significant difference between the fat treated groups and the control one in body weight and absolute liver weights. Table 1: Body weight and absolute liver weight recorded in control and experimental rats at 2 months. Serum TC, TG, LDL-C and VLDL-C levels revealed significant (P ≤ 0.05) increase in F-group compared with the control group, but HDL-C level showed significant (P ≤ 0.05) decrease. On the other hand, lipid profile parameters appeared to be significantly (P ≤ 0.05) improved with dietary supplementation in comparison with the F-group (TABLE 2). Table 2: Serum lipid profile measured in control and experimental rats at 2 months. Serum liver transaminases (AST and ALT), LDH, CK-NAC and CKMB activities and H-FABP level were significantly (P ≤ 0.05) elevated in rats of F-group with significantly (P ≤ 0.05) decreased TP, albumin and NO levels in comparison with the control rats. Otherwise, fat treated groups with choline, OO, GO and mix showed significant (P ≤ 0.05) decline in AST, ALT, LDH, CK and CKMB activities and H-FABP level together with significant (P ≤ 0.05) hyperproteinemia, hyperalbuminemia and raised NO level compared to F-group (TABLE 3). Table 3: Serum hepatic and cardiac function biochemical markers measured in control and experimental groups at 2 months. As shown in TABLE 4, F-group revealed significant (P ≤ 0.05) increase in leptin level with significant (P ≤ 0.05) decrease in adiponectin level when compared to that of the control group. While, F-choline, F-OO, F-GO and F-Mix revealed significant (P ≤ 0.05) reduction in leptin hormone and increase in adiponectin hormone levels compared to F-group. Table 4: Serum leptin and adiponectin levels measured in control and experimental groups at 2 months. Rats fed high fat diet elucidated lipid peroxidation of the liver and heart tissues evidenced by significant (P ≤ 0.05) high level of MDA compared to the control rats. While, rats in other groups supplied with dietary supplements together with the fat diet, showed significant decrease in MDA level compared with F-group. Whereas, rats in all treated fat groups exhibited significantly (P ≤ 0.05) raised SOD activities and GSH levels in liver and heart tissues compared with untreated F-group, thus improving the antioxidant capacity (TABLE 5). Table 5: Hepatic and cardiac tissues lipid peroxidation and antioxidant status in different experimental groups at 2 months. Liver: Liver of control group showed normal histological structures, hepatic lobules were of same size and shape with normal portal areas. Each lobule had a centrally located central vein and radiating columns of hepatic cells. Hepatic cells were hexagonal in shape with abundant eosinophilic cytoplasm and centrally located basophilic nuclei. Hepatic sinusoids were normal (FIG. 1a). All livers of F-group rats showed various degrees of fat infiltration inside the hepatic cells which represented by unstained vacuoles inside the hepatocytes. The vacuoles were of various shapes and sizes and some were coalesce forming large vacuoles. Some cases developed inflammatory reaction around hepatic areas and around some of the congested central veins along with fibrous connective tissue proliferation (FIG. 1b). The fibrous tissue extends from portal areas to another (porto-portal, grade II). The liver of group F-choline revealed mild to moderate fat infiltrations in hepatocytes and focal infiltration with lymphocytes and few macrophages around hepatic areas (FIG. 1c). F-OO rats showed mild to moderate infiltrations with fat and focal leukocytic infiltrations around hepatic areas (FIG. 1d). F-GO rats revealed marked reduction in fat infiltrations inside hepatocytes and multifocal marked inflammatory reactions around hepatic areas (FIG. 1e). F-mix rats showed pronounced improvement of hepatic cells with mild vacuoles along with multiple foci of leukocytes around hepatic areas (FIG. 1f). 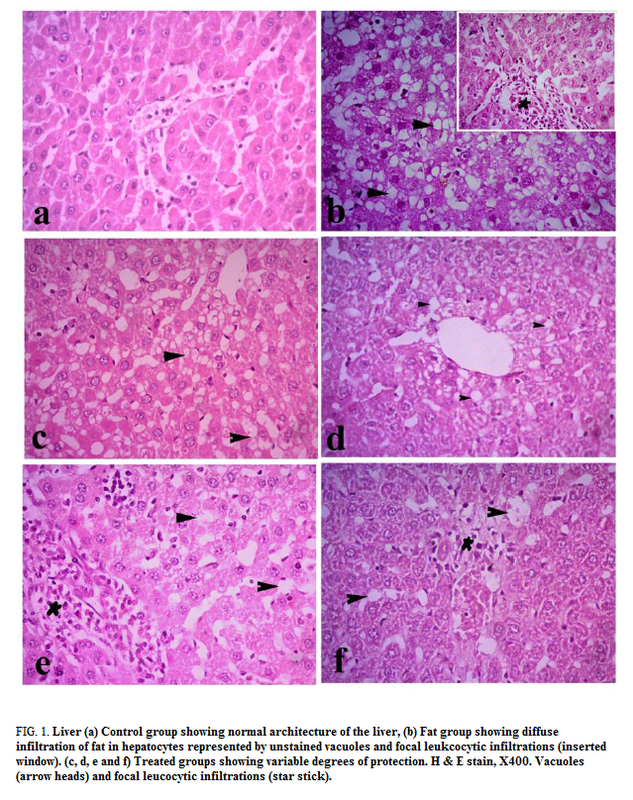 Figure 1: Liver (a) Control group showing normal architecture of the liver, (b) Fat group showing diffuse infiltration of fat in hepatocytes represented by unstained vacuoles and focal leukcocytic infiltrations (inserted window). (c, d, e and f) Treated groups showing variable degrees of protection. H & E stain, X400. Vacuoles (arrow heads) and focal leucocytic infiltrations (star stick). Aorta: Aorta of control group showed normal histological structures of the three aortic layers, tunica intema which facing the lumen and consists of flattened endothelial cells, tunica media which consists of smooth muscles and elastic fibers and the outer tunica adventitia which consists of collagen fibers (FIG. 2a). All sections of aorta in F-group showed swelling of the fibers in the wall with marked thickening of the elastic fibers and focal hyalinization of smooth muscles, along with focal basophilic depositions and prominent vacuoles in sub-intema (FIG. 2b). The aorta of F-choline group revealed mild swelling and disposition of fat vacuoles (FIG. 2c). F-OO group showed mild to moderate thickening of the tunica media along with vacuolation and discontinuity of tunica intema (FIG. 2d). F-GO group revealed marked reduction in fat deposition with reduced hyalinization of the muscles (FIG. 2e). F-mix group showed pronounced improvement and protection against the fat diet (FIG. 2f). Figure 2: Abdominal aorta, (a) control group showing normal architecture of the aorta, (b) fat group showing focal basophilic depositions (arrow heads) with marked infiltration of fat vacuoles forming foam cells (arrows) and prominent thickening of elastic fibers. (c, d, e and f) treated groups showing variable degrees of protection where (f) showing fairly normal architecture. H & E stain, X400. (Tunica intima; I, Tunica media; M and Tunica adventitia; A). Unhealthy lifestyle as taking high-fat diet, being overweight, smoking, heavy alcohol use and lack of exercise can lead to abnormal cholesterol level and liberation of free radicals. Onion and garlic are rich in some essential fatty acids and some bioactive compounds that play an important role in fat metabolism and elimination of free radicals. These effects are strongly needed in some developing countries; suffering from several diseases caused by eating unbalanced diet that rich in saturated fats. This result came in agreement with Hooper et al. . Meanwhile, the treated fat groups showed significant decrease in their body weight compared to F group. As, choline had a breaking down action on fats resulting in overall weight loss . Onion and garlic have anti-obesity effect due to sulfur-containing compounds . The obtained data were in harmony with that indicated by El-Demerdash et al. .
Elevated lipid level and its accumulation can induce coronary atherosclerosis  through the formation of fibrous plaques within the wall of the large and middle arteries , resulting in narrowing of the arteries that supply blood to the myocardium, limiting blood flow and producing insufficient amounts of oxygen to meet the needs of the heart. In the current study, F-group manifested disturbed lipid profile. Where, increased susceptibility of LDL-C to lipid peroxidation, would result in LDL-C oxidation and atherosclerosis occurrence . The increase in serum TG could be attributed to an increase in hepatic VLDL production and secretion, increased de novo hepatic fatty acid synthesis, inhibition of fatty acid oxidation and reduction in lipoprotein lipase . Furthermore, the increase in TC level due to activated 3-hydroxy-3-methylglutaryl-CoA (HMG-coA) reductase . On the other hand, dietary supplements showed significant improvement in lipid profile level. As formerly explained, phosphotidyl choline (PC) could promote fatty acid catabolism via β-oxidation  and activate bile acid synthesis . OO has a lipid-lowering effect due to various bioactive compounds including quercetin, that reduced the triacylglycerol and VLDL formation by suppressing diacylglycerol acyltransferase and acetyl-CoA carboxylase activities . Moreover, GO significantly decreased LDL-C level via decrease of hepatic HMG-CoA reductase, cholesterol 7α-hydroxylase, pentose-phosphate pathway activities , increase of bile acid excretion  and inhibition of hepatic fatty acid synthesis . This reduction is probably due to diallyl disulfide (DADS) present in garlic . Garlic could express anti-atherosclerotic activity through repressed LDL-C oxidation. Over and above, the decreased TG level might be referred to the stimulating effect of garlic on lipase enzyme . While, onion and garlic oil combination; favorably drew the bad effect of high fat diet on the lipid profile, due to the high content of organosulfur compounds, thus exhibiting a hypolipidemic effect. These results were authenticated by the histopathological observations. Serum liver and heart biomarkers were adversely affected by high fat diet supplementation, where, liver aminotransferases enzymes, LDH, CK-NAC and CKMB activities and H-FABP level were raised, while, total protein, albumin and NO levels were decreased. These results agreed with Panchal et al. and Faloppi et al. . Similarly, Amin and Nagy  recorded significant high serum ALT, LDH, CK-NAC and CK-MB activities in rats fed on high fat diets. ALT and AST are cytoplasmic enzymes, released into the blood after hepatic cellular damage . So, the reduction in total protein and albumin levels could be attributed to diminished synthesis resulting from hepatocellular damage  or stress due to the increased demand of the body to neutralize ROS provoked by high fat diet . Likewise, AST, LDH and CK are cytosolic enzymes in the myocardial cells, which emerge into the circulation upon cell injury serving as diagnostic tools of myocardial diseases [60,61]. Furthermore, H-FABP is protein of low molecular weight in the cytoplasm of cardiac myocytes and is regarded as a sensitive indicator of outstanding myocardial injury . H-FABP adjusts the intracellular lipid transport in myocardium and thus modulates the metabolic state . Elevated serum H-FABP levels were recorded in NAFLD , which might serve as subclinical myocardial injury. Otherwise, treated fat groups lowered the activities of the estimated marker enzymes in comparison to the F-group, denoting that choline, onion and garlic had antioxidative action toward ROS, thus preventing leakage of liver enzymes into circulation through preserving cell membrane stability . In addition, choline is an essential nutrient that is required for the formation of PC, which is necessary for the integrity of the cell membranes . Veenema et al. stated that adequate intake levels of choline are sufficient for preventing elevation of LDH enzyme. Our results came in line with Hanaa et al. , Marcolin et al. and Nabila  who deduced significant reduction in the activities of liver aminotransferases with garlic oil, choline and onion supplementation respectively. As well, elevation of total protein and albumin levels in the treated groups could be attributed to their antioxidant effects against ROS, thus they improved the liver function to synthesize protein and albumin [69-71]. NO is synthesized in the endothelial lining of blood vessels and is renowned to have a relaxing effect on the surrounding smooth muscles leading to vasodilatation and increasing the blood flow. Regarding the high fat diet adverse effect, Ferdinandy et al. reported that sustained feeding on high cholesterol diet led to decreased cardiac NO level. Similarly, Giricz et al. and Ónody et al. reported reduced cardiac NO content in hyperlipidemic group rats, as hyperlipidemia results in cardiac stress due to disturbance in nitric oxide metabolism. Where, unsteady production of endothelial NO synthase (eNOS) enzyme occurs, leading to lower NO generation and endothelial injury . Huang et al. demonstrated that diminished NO bioavailability in lean female Zucker rats fed on high fat diet may arise due to a decrease in NO production from L-arginine or oxidation of NO by ROS superoxide. Furthermore, hypoadiponectemia led to reduced NO production as a result of retarded eNOS phosphorylation . Further, dietary supplementation of choline and nutraceuticals enhanced the NO bioavailability, in agreement with Predmore et al. . Garlic was found to increase the production of NO in normal human volunteers  and quercetin had proved to boost NO bioavailability [80,81]. Adipokines secreted by adipocytes that infiltrated the adipose tissue in insulin-resistant states; take in a role in NAFLD pathogenesis which is associated with cardiovascular diseases. NAFLD pathogenesis includes hyperleptinemia due to increased release of cytokines as IF-γ, TNF-α and TGF-β1 . Furthermore, adiponectin promotes fat oxidation and minimizes denovo fatty acid synthesis . Hypoadiponectemia recorded in NAFLD, resulted in abnormal fat metabolism in hepatocytes and fat accumulation . In the present study, F-group had significantly increased serum leptin level and decreased adiponectin level compared to control group. Gnacinska et al. deduced that leptin concentrations are positively correlated with adiposity and body weight alterations. While, Lihnet al. stated that adiponectin has negative correlations with measure of adiposity. Dietary supplements improved body weight therefore upgraded the levels of leptin and adiponectin hormones and elucidated to have anti-obesity effect, where choline could promote fatty acid β-oxidation [46,87]. Quercetin and garlic sulfur compounds had anti-obesity effect that depressed adiposity [48,88]. Hepatic and cardiac tissues oxidative stress was clear in rats fed on high fat diet, while, dietary supplementation of other groups with natural products ameliorated the oxidative effect induced by the high fat diet. In accordance with Ónody et al. who mentioned that plasma MDA was significantly increased in cholesterol-fed rats as compared to controls. Similarly, Otunola et al. observed oxidative exertion in the hypercholesterolemic rats evidenced by increased MDA levels and suppressed antioxidant enzymes in the liver, kidney, heart and brain tissues, and reported also reduced MDA levels and restored activities of antioxidant enzymes upon supplementation with spices extracts. Prevailing of ROS is approved to be more efficient in prohibiting cardiovascular diseases than limited consumption of fat diets . Mitochondrial dysfunction participates in the pathogenesis of NAFLD at different levels, including lipid oxidation impairment and the induction of peroxide production . The current study has outlined some biochemical pathways contributing to the pathogenesis of NAFLD. While, the details of many of these pathways are still being elucidated; it provided targets for future therapeutic strategies in NAFLD and emphasized their impacts for prohibiting atherosclerosis. The protective effects of nutraceuticals specifically; onion and garlic oils as well as choline, against the adverse influence of NAFLD on hepatic and cardiac activities had been addressed. Onion and garlic combination proved to have synergistic and effective hypolipidemic, antioxidant and anti-atherogenic influences in rats fed high fat diet than administering each supplement alone. Gomez-Lechon MJ, Jover R, Donato MT. Cytochrome p450 and steatosis. Curr Drug Metab. 2009;10(7):692-9. Gaggini M, Morelli M, Buzzigoli E, et al. Non-alcoholic fatty liver disease (NAFLD) and its connection with insulin resistance, dyslipidemia, atherosclerosis and coronary heart disease. Nutrients. 2013;5(5):1544-60. Mishra PR, Panda PK, Apanna KC, et al. Evaluation of acute hypolipidemic activity of different plant extracts in Triton WR-1339 induced hyperlipidemia in albino rats. Pharmacologyonline. 2011;3:925-34. Buring JE, Connor GT, Goldhaber SZ, et al. Decreased HDL2 and HDL3 cholesterol, Apo A-I and Apo A-II, and increased risk of myocardial infarction. Circulation. 1992;85(1):22. Roberts WC. Preventing and arresting coronary atherosclerosis. Am Heart J. 1995;130(3, Part 1):580-600. Yusuf S, Hawken S, Ôunpuu S, et al. Effect of potentially modifiable risk factors associated with myocardial infarction in 52 countries (the INTERHEART study): case-control study. The Lancet. 2004;364(9438):937-52. Zeisel SH, da Costa KA, Albright CD, et al. Choline and hepatocarcinogenesis in the rat. Adv Exp Med Biol. 1995;375:65-74. Buchman AL, Ament ME, Sohel M, et al. Choline deficiency causes reversible hepatic abnormalities in patients receiving parenteral nutrition: proof of a human choline requirement: A placebo-controlled trial. JPEN J Parenter Enteral Nutr. 2001;25(5):260-8. Csonka C, Sarkozy M, Pipicz M, et al. Modulation of hypercholesterolemia-induced oxidative/nitrative stress in the heart. Oxidative Medicine and Cellular Longevity. 2016;2016:23. Lampe JW. Health effects of vegetables and fruit: Assessing mechanisms of action in human experimental studies. Am J Clin Nutr. 1999;70(3 Suppl):475S-90S. Augusti KT, Mathew PT. Lipid lowering effect of allicin (diallyl disulphide-oxide) on long term feeding to normal rats. Experientia. 1974;30(5):468-70. Corzo-Martínez M, Corzo N, Villamiel M. Biological properties of onions and garlic. Trends in Food Science & Technology. 2007;18(12):609-25. Panchal SK, Poudyal H, Brown L. Quercetin ameliorates cardiovascular, hepatic, and metabolic changes in diet-induced metabolic syndrome in rats. The J Nutrition. 2012;142(6):1026-32. Otunola GA, Oloyede OB, Oladiji AT, et al. Selected spices and their combination modulate hypercholesterolemia-induced oxidative stress in experimental rats. Biological Research. 2014;47(1):5. Packia LNCJ, Viveka S, Viswanathan MB, et al. GC-MS characterization of volatile odorous compounds in Allium cepa. Conference Paper. 2014. Guo X, Du A, Guan C, et al. Analysis of volatile oil of garlic by gas chromatography-mass spectrometry. Se Pu. 2005;23(5):548-50. Qamar A, Usmani A, Waqar H, et al. 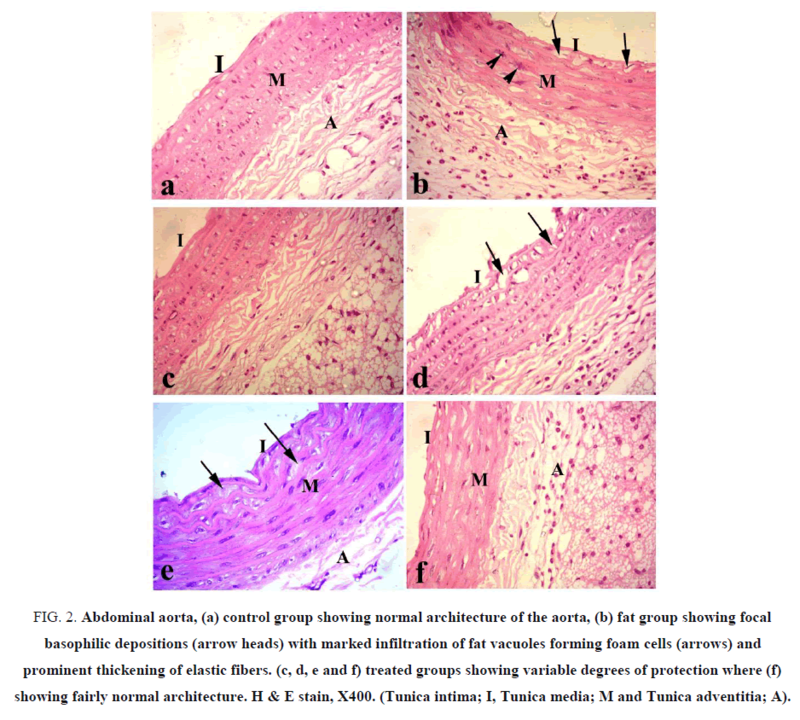 Ameliorating effect of Allium Sativum on high-fat diet induced fatty liver in albino rats. Pak J Med Sci. 2016;32(2):403-7. Axen KV and Axen K. Very low-carbohydrate versus isocaloric high-carbohydrate diet in dietary obese rats. Obesity. 2006;14(8):1344-52. Borges Haubert NJ, Marchini JS, Carvalho Cunha SF, et al. Choline and Fructooligosaccharide: Non-alcoholic fatty liver disease, cardiac fat deposition, and oxidative stress markers. Nutr Metab Insights. 2015;8:1-6. Sajitha GR, Augusti KT, Jose R. Prophylactic effects of garlic oil and onion oil fractions as compared to vitamin e on rats orally fed with lead acetate solution. Indian J Clin Biochem. 2016;31(3):260-9. Rivellese AA, Auletta P, Marotta G, et al. Long-term metabolic effects of two dietary methods of treating hyperlipidaemia. BMJ: British Medical Journal. 1994;308(6923):227-31. Tietz NW. Clinical Guide to Laboratory Tests. 2nd ed, WB SaundersCompany, Philadelphia, USA. 1990:554?6. Davidson MH, Rosenson RS. Novel targets that affect high-density lipoprotein metabolism: the next frontier. The American Journal of Cardiology. 2009;104(10, Supplement):52E-7E. Reitman S, Frankel S. A colorimetric method for the determination of serum glutamic oxalacetic and glutamic pyruvic transaminases. American J Clinical Pathology. 1957;28(1):56-63. Buhl SN, Jackson KY. Optimal conditions and comparison of lactate dehydrogenase catalysis of the lactate-to-pyruvate and pyruvate-to-lactate reactions in human serum at 25, 30, and 37 degrees C. Clinical Chemistry. 1978;24(5):828-31. Gornall AG, Bardawill CJ, David MM. Determination of serum proteins by means of the biuret reaction. J Biological Chem. 1949;177(2):751-66. Doumas BT, Ard Watson W, Biggs HG. Albumin standards and the measurement of serum albumin with bromcresol green. Clinica Chimica Acta. 1971;31(1):87-96. Masaki T, Yoshimatsu H, Kakuma T, et al. Enhanced expression of uncoupling protein 2 gene in rat white adipose tissue and skeletal muscle following chronic treatment with thyroid hormone. FEBS Letters. 1997;418(3):323-6. Mathieu Mec. Recommendation pour la mesure de la concentration catalytique de la cratinine kinase dans le serum humain. Ann Biol Clin. 1982;40:87. Chan DW, Taylor E, Frye R, et al. Immunoenzymetric assay for creatine kinase MB with subunit specific monoclonal antibodies compared with immunochemical method and electrophoresis. Clin Chem. 1985;31:465-9. Arimoto T, Takeishi Y, Niizeki T, et al. Cardiac sympathetic denervation and ongoing myocardial damage for prognosis in early stages of heart failure. J Cardiac Failure. 2007;13(1):34-41. Green LC, Wagner DA, Glogowski J, et al. Analysis of nitrate, nitrite, and [15N] nitrate in biological fluids. Analytical Biochem. 1982;126(1):131-8. Kei S. Serum lipid peroxide in cerebrovascular disorders determined by a new colorimetric method. Clinica Chimica Acta. 1978;90(1):37-43. Nishikimi M, Appaji Rao N, Yagi K. The occurrence of superoxide anion in the reaction of reduced phenazine methosulfate and molecular oxygen. Biochem and Biophys Res Comm. 1972;46(2):849-54. Beutler E, Duron O, Kelly BM. Improved method for the determination of blood glutathione. J Lab Clin Med. 1963;61:882-8. Bancroft I, Wolk P, Oren EV. Physical and genetic maps of the genome of the heterocyst-forming cyanobacterium Anabaena sp. strain PCC7120. Journal of Bacteriology. 1990;171:5940-8. Hooper L, Abdelhamid A, Bunn D, et al. Effects of total fat intake on body weight. Cochrane Database Syst Rev. 2015(8):CD011834. Elsawy G, Abdelrahman O, Hamza A. Effect of choline supplementation on rapid weight loss and biochemical variables among female taekwondo and judo athletes. J Human Kinetics. 2014;40:77-82. Kumari K, Augusti KT. Antidiabetic and antioxidant effects of S-methyl cysteine sulfoxide isolated from onions (Allium cepa Linn) as compared to standard drugs in alloxan diabetic rats. Indian J Exp Biol. 2002;40(9):1005-9. El-Demerdash FM, Yousef MI, El-Naga NI. Biochemical study on the hypoglycemic effects of onion and garlic in alloxan-induced diabetic rats. Food Chem Toxicol. 2005;43(1):57-63. Gao W, He HW, Wang ZM, et al. Plasma levels of lipometabolism-related miR-122 and miR-370 are increased in patients with hyperlipidemia and associated with coronary artery disease. Lipids Health Dis. 2012;11:55. Wouters K, Shiri-Sverdlov R, van Gorp Patrick J, et al. Understanding hyperlipidemia and atherosclerosis: lessons from genetically modified apoe and ldlr mice. Clinical Chem and Laboratory Med (CCLM)2005. p. 470. Rami´rez-Tortosa MC, Mesa MD, Aguilera MC, et al. Oral administration of a turmeric extract inhibits LDL oxidation and has hypocholesterolemic effects in rabbits with experimental atherosclerosis. Atherosclerosis. 1999;147(2):371-8. Khovidhunkit W, Kim MS, Memon RA, et al. Effects of infection and inflammation on lipid and lipoprotein metabolism: mechanisms and consequences to the host. J Lipid Res. 2004;45(7):1169-96. Ness GC. Physiological feedback regulation of cholesterol biosynthesis: Role of translational control of hepatic HMG-CoA reductase and possible involvement of oxylanosterols. Biochim Biophys Acta. 2015;1851(5):667-73. Chakravarthy MV, Lodhi IJ, Yin L, et al. Identification of a physiologically relevant endogenous ligand for PPARalpha in liver. Cell. 2009;138(3):476-88. Lee JM, Lee YK, Mamrosh JL, et al. A nuclear-receptor-dependent phosphatidylcholine pathway with antidiabetic effects. Nature. 2011;474(7352):506-10. Gnoni GV, Paglialonga G, Siculella L. Quercetin inhibits fatty acid and triacylglycerol synthesis in rat-liver cells. Eur J Clin Invest. 2009;39(9):761-8. Qureshi AA, Din ZZ, Abuirmeileh N, et al. Suppression of avian hepatic lipid metabolism by solvent extracts of garlic: impact on serum lipids. J Nutr. 1983;113(9):1746-55. Stephen W, Russell S, Sivak S. Effect of garlic on total serum cholesterol. J Nutr. 1993;119:599?605. Chang MLW, Johnson MA. Effect of garlic on carbohydrate metabolism and lipid synthesis in rats. The Journal of Nutrition. 1980;110(5):931-6. Shoetan A, Augusti KT, Joseph PK. Hypolipidemic effects of garlic oil in rats fed ethanol and a high lipid diet. Experientia. 1984;40(3):261-3. Warshafsky S, Russel SK, Steven LS. Effect of garlic on total serum cholesterol. Meta-analysis. Annals Intern Med. 1993;119:599-605. Panchal SK, Poudyal H, Iyer A, et al. High-carbohydrate, high-fat diet-induced metabolic syndrome and cardiovascular remodeling in rats. J Cardiovasc Pharmacol. 2011;57(5):611-24. Faloppi L, Bianconi M, Memeo R, et al. Lactate dehydrogenase in hepatocellular carcinoma: Something old, something new. BioMed Res Inter. 2016;2016, 7196280. Amin KA, Nagy MA. Effect of Carnitine and herbal mixture extract on obesity induced by high fat diet in rats. Diabetology and Metabolic Syndrome. 2009;1:17-. Ozougwu JC, Eyo JE. Hepatoprotective effects of Allium cepa (onion) extracts against paracetamol-induced liver damage in rats. African J of Biotechnol. 2014;13(26):2679-88. Woodman DD. Assessment of Hepatoxicity. In: Animal Clinical Chemistry, A Primer for Toxicologist. Evans, GO, editor; Taylor & Francis: London, UK. 1996:71-86. Lu LS, Wu CC, Hung LM, et al. Apocynin alleviated hepatic oxidative burden and reduced liver injury in hypercholesterolaemia. Liver Int. 2007;27(4):529-37. Sabeena Farvin KH, Anandan R, Senthil Kumar SH, et al. Effect of squalene on tissue defense system in isoproterenol-induced myocardial infarction in rats. Pharmacological Res. 2004;50(3):231-6. Basheeruddin ASM, Naseeruddin IM. Pharmacodynamic interaction of captopril with garlic in isoproterenol-induced myocardial damage in rat. Phytotherapy Research. 2010;24(5):720-5. Otaki Y, Takahashi H, Watanabe T, et al. Heart-type fatty acid binding protein and high-sensitivity troponin T are myocardial damage markers that could predict adverse clinical outcomes in patients with peripheral artery disease. BBA Clinical. 2015;4:35-41. Binas B, Danneberg H, Mcwhir J, et al. Requirement for heart-type fatty acid binding protein in cardiac fatty acid utilization. FASEB J 1999;13:805-12. Basar O, Akbal E, Koklu S, et al. Increased H-FABP concentrations in nonalcoholic fatty liver disease. Herz. 2013;38(4):417-22. Veenema K, Solis C, Li R, et al. Adequate Intake levels of choline are sufficient for preventing elevations in serum markers of liver dysfunction in Mexican American men but are not optimal for minimizing plasma total homocysteine increases after a methionine load. The Am J of Clin Nutrition. 2008;88(3):685-92. Wafay H, El-Saeed G, El-Toukhy S, et al. Potential effect of garlic oil and silymarin on carbon tetrachloride-induced liver injury. Aus J of Basic and App Sci. 2012;6(3):409-14. Marcolin E, Forgiarini LF, Rodrigues G, et al. Quercetin decreases liver damage in mice with non-alcoholic steatohepatitis. Basic Clin Pharmacol Toxicol. 2013;112:385-91. Nabila MR. Effect of physalis and choline on lipid profile and antioxidant activity in hepatic toxicity rats. Australian J of Basic and App Sci. 2012;6:654-60. Barakat HA, Hamza AH. Glycine alleviates liver injury induced by deficiency in methionine and or choline in rats. Eur Rev Med Pharmacol Sci. 2012;16(6):728-36. Binaii M, Ghiasi M, Farabi SM, et al. Biochemical and hemato-immunological parameters in juvenile beluga (Huso huso) following the diet supplemented with nettle (Urtica dioica). Fish Shellfish Immunol. 2014;36(1):46-51. Kanani HG, Nobahar Z, Kakoolaki S, et al. Effect of ginger- and garlic-supplemented diet on growth performance, some hematological parameters and immune responses in juvenile Huso huso. Fish Physiol Biochem. 2014;40(2):481-90. Ferdinandy P, Szilvássy Z, Horváth LI, et al. Loss of pacing-induced preconditioning in rat hearts: Role of nitric oxide and cholesterol-enriched diet. J Mol and Cellular Cardiol. 1997;29(12):3321-33. Giricz Z, Csonka C, Ónody A, et al. Role of cholesterol-enriched dietand the mevalonate pathway in cardiac nitric oxidesynthesis. Basic Res in Cardiol. 2003;98(5):304-10. Ónody A, Csonka C, Giricz Z, et al. Hyperlipidemia induced by a cholesterol-rich diet leads to enhanced peroxynitrite formation in rat hearts. Cardiovascular Res. 2003;58(3):663-70. Lokhande PD, Dhawaren BS, Jagdale SC, et al. Cardia cactivity of isolated constituents of Inula racemosa. J Herb Pharmcother. 2006;6:81?8. Huang K, Huang Y, Frankel J, et al. The short-term consumption of a moderately high-fat diet alters nitric oxide bioavailability in lean female Zucker rats. Canadian Journal of Physiology and Pharmacology. 2011;89(4):245-57. Prieto D, Contreras C, Sanchez A. Endothelial Dysfunction, Obesity and Insulin Resistance2014. 412-26 p.
Predmore BL, Kondo K, Bhushan S, et al. The polysulfide diallyl trisulfide protects the ischemic myocardium by preservation of endogenous hydrogen sulfide and increasing nitric oxide bioavailability. American Journal of Physiology-Heart and Circulatory Physiology. 2012;302(11):H2410-H8. Bhattacharyya M, Girish GV, Karmohapatra SK, et al. Systemic production of IFN-a by garlic (Allium sativum) in humans. J Interferon and Cytokine Research. 2007;27(5):377-82. Duarte J, Jiménez R, O'Valle F, et al. Protective effects of the flavonoid quercetin in chronic nitric oxide deficient rats. J Hypertens. 2002;20(9):1843-54. Abdullaev S, Kozaeva L, Medvedev O, et al. Quercetin increases nitric oxide-dependent dilation in rat thoracic aorta. J of Hypertension. 2018;36:e47. Machado M, Coutinho J, Carepa F, et al. How adiponectin, leptin and ghrelin orchestrate together and correlate with the severity of nonalcoholic fatty liver disease. Eur J Gastroenterol Hepatol 2012;24:1166-72. Musso G, Gambino R, De Michieli F, et al. Adiponectin gene polymorphisms modulate acute adiponectin response to dietary fat: possible pathogenetic role in NASH. Hepatology 2008;47(4):1167?77. Bajaj M, Suraamornkul S, Piper P, et al. Decreased plasma adiponectin concentrations are closely related to hepatic fat content and hepatic insulin resistance in pioglitazone-treated type 2 diabetic patients. J Clin Endocrinol Metab. 2004;89:200-6. Gnacinska M, Malgorzewicz S, Stojek M, et al. Role of adipokines in complications related to obesity: A review. Adv Med Sci. 2009;54(2):150-7. Lihn AS, Pedersen SB, Richelsen B. Adiponectin: Action, regulation and association to insulin sensitivity. Obes Rev. 2005;6(1):13-21. Daily JW, Sachan DS. Choline supplementation alters carnitine homeostasis in humans and guinea pigs. J Nutr. 1995;125(7):1938-44. Kang SA, Shin HJ, Jang KH, et al. Effect of garlic on serum lipids profiles and leptin in rats fed high fat diet. J Food Sci Nutr. 2006;11:48-53. Maxwell SRJ, Lip GYH. Free radicals and antioxidants in cardiovascular disease. British Journal of Clinical Pharmacology. 1997;44(4):307-17. Heibashy MIA, Zaki NA, El-Nahrawy WAM. Alterations in Insulin, Leptin, Orexin-A and Neuropeptide-Y levels in the high-fat diet fed rats. Australian J of Basic and App Sci. 2010;4(6):1473-81.